Here you are, ready to launch your brand new site – but is there anything you’re forgetting? Magento requires several parameters to be in place in order to ensure a successful launch. 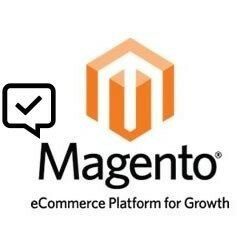 Here is a complete Pre-Launch Checklist for your Magento site. You only get one first launch, so let’s make sure it’s done right. Base URLs – Before you deploy your site, make sure to update your Base URLs or all your URLs will refer back to your staging site. You can find these at in your database table core_config_data but can also be accessed through the admin interface: System > Configuration > Web. Favicons – Most users keep multiple tabs open while browsing – don’t forget to create your Favicon for ease of browsing and visual brand reinforcement. Transactional Email – Transactional emails use a different logo than the default one. Check that your logo is saved in your theme directory as logo_email.gif Test to make sure these emails are working properly and also check that your payment gateways are set to go live. SSL Certificate – many payment gateways will not allow you to go live until you have one. Invoice and Packing Slip Design – Upload your logo and add contact info to your invoices. System > Configuration > Sales > Invoice and packing slip design. You can also place logo_email.gif in your images folder in the skin directory. Shipping Methods – Make sure your fixed product or cart fee is set. If you are measuring by cart weight, confirm that it is functioning properly and that all products have weights attached to them. Clear Test Data and Move – Remove all products, orders and customers that were created during testing. If you are creating a new version of an existing site, move your existing customers and orders over for a seamless customer experience. Product Inventory – you might need to do another product import with the correct stock levels before you go live. Index Management – Make sure you’ve re-indexed after making changes to the catalog. Minify the CSS – Use a CSS Compressor – keep a readable file and a minified version. Error Page Design -When there is an error on the site, or the maintenance.flag file is set, a different theme is used to display the error message. If you don’t change this, your customers will see the default Magento theme and logo. To avoid this, you’ll need to modify the files located in the errors directory. You will also not want the error page to print a stack trace, instead you can set an email address to which it can send the error report.You will not want the error page to print a stack trace. Assuming you are working from the sample, open errors/local.xml and then change the action from “print” to “email”. Caching – remember to re-enable and refresh caching when you are ready to go. System Compilation – Another way to cut down the loading time of your Magento site, is to compile it. You can find settings for this in System > Tools > Compilation. Google Merchant Center – This involves a few more steps than we are comfortably able to add here – check out our step-by-step screencast for easy instructions. Google Sitemap – SEO essential -“Create Sitemap” in Catalog > Google Sitemap. If you’re using Google Webmaster Tools, you can also point Google towards it. Regenerate the sitemap whenever content, categories or products are changed. Newsletter Subscriptions – test to ensure functionality such as sign-up, send-out and unsubscribe. Module Licenses – Your MagentoConnect module may require a license key. Make sure the key remains valid when you move domains. PHP Configuration – make sure you have appropriate values set for memory_limit and max_execution_time. If these values are too restrictive, product import/export can fail. Set up DB restoration and backup strategy – make sure your contingency plan is in place before you launch. Test for Speed – Many tools or extensions can be used to test speeds and identify weak points. One such tool is Google PageSpeed Insights.